(by Hamza Hendawi, Chicago Sun Times) – (AP) CAIRO – Egypt’s two highest appeals courts suspended their work Wednesday to protest presidential decrees that gave the country’s Islamist leader Mohammed Morsi nearly absolute powers, state television reported. Judges of the Cassation Court decided in an emergency meeting that they will not return to work until Morsi rescinds his decrees, according to state TV. The country’s lower appeals court also decided Wednesday to stop work nationwide. The move followed a defiant statement by the Supreme Constitutional Court that rejected charges made by Morsi and his Muslim Brotherhood that [the court] is working to bring down his government. The developments are likely to stoke the political turmoil triggered by Morsi when he issued a constitutional declaration last Thursday that placed him above oversight of any kind, including by the courts, and extended similar protection to parliament’s lower chamber and a 100-member panel drafting a new constitution. The constitutional court, which is not [taking part] in the suspension, is due to rule Sunday on the legality of the two bodies, which are dominated by the Muslim Brotherhood and other Islamists*. A ruling, regardless of which way it goes, would constitute a direct challenge to Morsi, who took office in June as Egypt’s first freely elected president but has enraged pro-democracy activists who claim he is acting too much like the authoritarian leader he replaced. The court ruled in June to dissolve parliament’s lower chamber, also dominated by Islamists, a decision that Morsi and his Islamist allies described as part of a “conspiracy” to bring down the regime. A strike by the appeals courts and the rare criticism of the president contained in the Supreme Constitutional Court’s statement come a day after at least 200,000 people gathered at Cairo’s Tahrir square to protest Morsi’s decrees, which also gave him unlimited powers to “protect” the nation. The size of the protest was [similar to] some of the larger rallies held in the square during the 18-day uprising that toppled former President Hosni Mubarak’s authoritarian regime nearly two years ago. Clashes between some protesters and police continued Wednesday. The [secular] opposition has said it would not enter a dialogue with the president about the country’s latest political crisis before Morsi rescinded his decrees. They plan another massive rally on Friday. *NOTE: Islamism is an ideology (Islam is a religion). Islamists support Shariah (Islamic) law, and wish to have it implemented in as many countries as possible; preferably throughout the entire world. A few Islamists may advocate such radical change via peaceful means, but most seem to advocate the change using violence. Copyright © 2012, Sun-Times Media, LLC. (From the Associated Press) Reprinted here for educational purposes only. May not be reproduced on other websites without permission from The Chicago Sun Times. Visit the website at SunTimes.com. 2. What do the judges from the appeals courts demand President Morsi do before they will return to work? 3. What power does President Morsi’s constitutional decree give to him and his (Muslim Brotherhood dominated) lower house of Parliament and constitution-writing panel? 4. What charges made by President Morsi and the Muslim Brotherhood did the Supreme Constitutional Court reject? 5. How are Egyptian citizens reacting to President Morsi’s decree? President Morsi said last Thursday that his decisions as president would be immune from judicial review, in a decree that would prevent judges from dissolving the committee – dominated by Islamist politicians from the powerful Muslim Brotherhood, which Mr. Morsi once led – that is responsible for drafting a new Egyptian constitution. In awarding himself expansive powers, Mr. Morsi provoked a popular backlash against him and other Islamists in the government. Similar protests broke out when the military council that ruled after Hosni Mubarak’s ouster moved to take greater control of government just before presidential polls. Following a series of political maneuvers since Mr. Morsi was elected in June, the president now claims full authority over the country’s military, executive and legislative branches. Many critics said they believed the main goal of Mr. Morsi’s latest decree was to enable an Islamist-dominated Constituent Assembly, the panel now drafting a new constitution, to push through a charter without opposition from the judiciary—the one arm of government in a position to do so. The Muslim Brotherhood, in interviews, statements and on social-networking sites, blamed the huge turnout [of approximately 200,000 Egyptians protesting President Morsi’s decree] on shady foreign forces and former regime cronies paying protesters to oppose their rule. Such explanations have often been used by challenged Arab autocrats. [Currently], the Egyptian Judicial System (or judicial branch) in Egypt, is an independent branch of the government which includes both secular and religious courts. The Egyptian judicial system is based on Europe and primarily French legal concepts and methods. The legal code is derived largely from the Napoleonic Code. Marriage and personal status are primarily based on the religious law of the individual concerned. Thus, there are three forms of family law in Egypt: Islamic, Christian, and secular (based on the French family laws). A widespread Islamist organization founded in 1928, the Brotherhood seeks to Islamize societies from the ground up and compel governments in Muslim countries to adhere to sharia, or Islamic law. 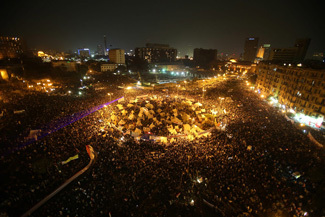 At various times in its history, the group has used or supported violence and has been repeatedly banned in Egypt for attempting to overthrow Cairo’s secular government. Since the 1970s, however, the Egyptian Brotherhood has disavowed violence and sought to participate in Egyptian politics. The U.S. State Department does not include the group on its list of terrorist organizations. Still, the Egyptian government mistrusts the Brotherhood’s pledge of nonviolence and continues to ban the organization. One reason the Brotherhood’s commitment to nonviolence is unclear: The original Egyptian organization has spawned branches in 70 countries. These organizations bear the Brotherhood name, but their connections to the founding group vary and some of them may provide financial, logistical, or other support to terrorist organizations. Some terrorist groups-including Hamas, Jamaat al-Islamiyya, and al-Qaeda-have historic and ideological affiliations with the Egyptian Brotherhood.